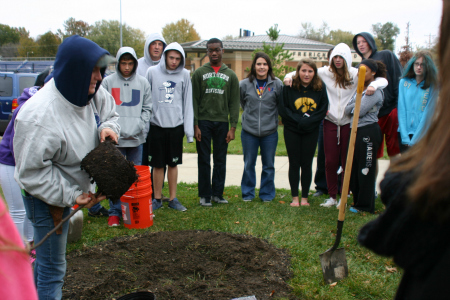 Learning, digging and growing were the themes for the day as students and teachers from Olmsted Elementary and Urbandale High School planted over $5,068 worth of trees at their schools the week of October 26, 2015. The generous donation of trees was made possible due to the Urbandale Education Foundation (UEF) having applied for and been awarded a grant by the Iowa DNR through their Trees For Kids program. 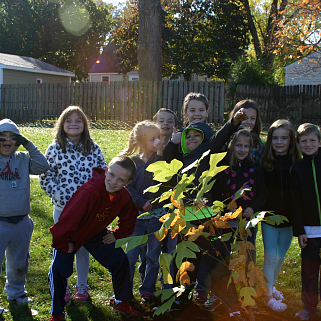 This is the third time the UEF has been awarded the grant, which has resulted in a total of over $30,000 and 160 trees planted throughout the Urbandale Community School District. “This is a great opportunity for Urbandale students to get hands-on learning with planting trees. 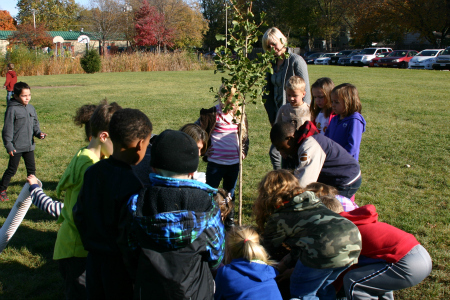 It also lets the students see the trees grow with them.” said Adam Obrecht, Urbandale Education Foundation Trees For Kids grant coordinator. 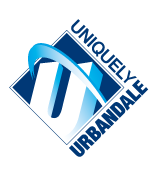 The UEF is a 501(c)(3) non-profit organization committed to enhancing the educational experience of students in the Urbandale Community School District by funding projects and initiatives not supported within existing school budgets. The UEF raises funds through grants and private donations and then invests in enhanced educational programming, innovative technology, scholarships for graduates, state-of-the-art facilities and lifelong learning opportunities. The UEF is in the unique position to provide support for Urbandale schools, award scholarships to UHS graduates and connect Urbandale alumni through the merger and partnership of three organizations: Urbandale Education Foundation, Urbandale Dollars for Scholars and Urbandale Alumni Association. 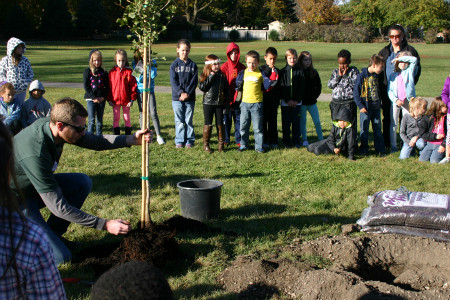 The District would like to thank Adam Obrecht, the Urbandale Education Foundation, the Iowa DNR, and our dedicated students and teachers for all their efforts in receiving the grant and planting the trees. Continual improvement is at the core of our District—both inside and outside the classroom—as we collaborate to create learning environments that truly engage, inspire, and connect with all learners. Great teamwork!